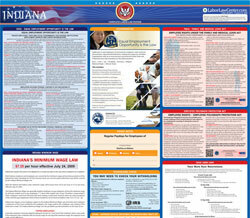 The Unemployment Insurance Poster is an unemployment law poster by the Indiana Department Of Workforce Development. This is a mandatory posting for all employers in Indiana, and businesses who fail to comply may be subject to fines or sanctions. This poster must be posted in a conspicuous place where all English speaking employees will see it. This poster describes how to qualify for unemployment and where to find information online. It appears you don't have a PDF plugin for this browser. Please see the link below to download indiana-english-ui-posterx-11.pdf. No deductions are made from employees’ pay for unemployment  insurance. This employer pays this tax.